The 4 Series modular DC loads allow multi-channel DC load systems to be configured with ease. 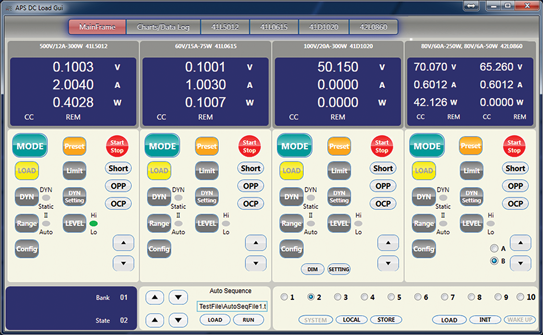 Available load modules range from single channel and dual channel to application specific LED simulator modules. Mainframes in the 4 Series can accommodate 1, 2 or 4 modules with a maximum 1600W of DC load capability and up to 8 loads per mainframe. The newest 41T model loads support TURBO mode which allows short term overload testing up to 3x times the rated current or power of the load. 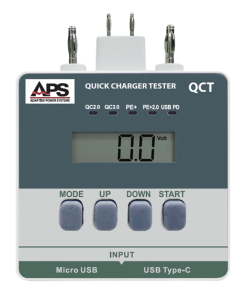 NEW: Quick Charger Test Option for 4 Series DC Loads. This optional fast charger test option supports testing of several fast charging protocols for mobile devices. See Models and Features tabs for details. If you can’t find what you are looking for on these product pages, contact us by phone or email to discuss your application requirements with one of our power specialist. 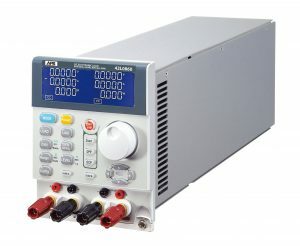 The Adaptive Power 4 Series of Programmable DC Electronic Load Modules are ideally suited for testing multiple output AC/DC power supplies, DC/DC converters, battery chargers, LED lighting power supplies and other power products. The high power density of the 4 Series allows up to 8 loads to be installed in a single 19″ wide rack-mount mainframe. For lesser demands, mainframes with two slots or a single slot are available as well. Note: For voltage requirements up to 600Vdc on 4 Series loads, contact factory for special quote. Note (1): Older generation 41D3002, 41D1020, 41D5002 and 42D5003 LED loads have been replaced by the new and improved LED load models shown above. Note (2): For voltage requirements up to 600Vdc on 4 Series loads, contact factory for special quote. Current Waveform Generator (Opt CWG): This plug in module is available for 44M DC Load mainframes and provides arbitrary current waveform programming for up to four DC load modules. 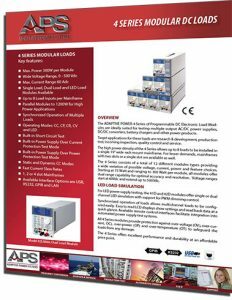 All APS 4 Series Modular Loads are equipped with a powerful microcontroller and user friendly controls to provide capabilities that cover a wide range of load applications. Built in metering of Voltage, Current, Power and Resistance. With a range of up to 8 load channels, the 42L load modules support testing for multiple output power supplies and AC/DC converters. 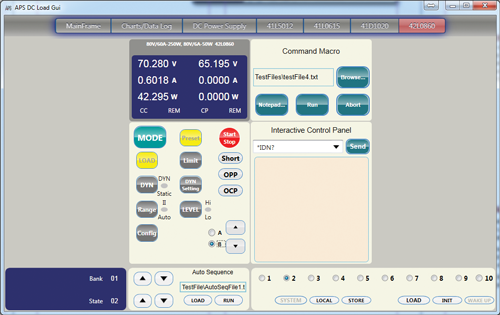 The ability to load all outputs simultaneously of to test up to eight single output DC supplies at once provides significant test throughput in high voltage production environments. Time sequencing of specific discharge current levels as a function of battery voltage allows characterization and performance testing of various battery chemistries. 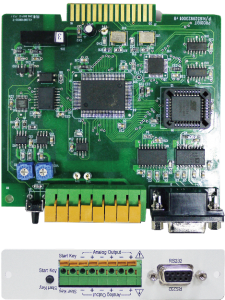 The high current resolution and accuracy of the 4 Series load modules supports testing of very small batteries for portable device applications. The latest 41T Series DC loads offer built-in battery discharge profiles and Lithium battery BMS test mode. 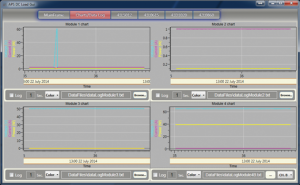 The 41D and 42D load modules are specially designed to support LED lighting applications by allowing accuracy simulation of LED load characteristic to be simulated. These modules simulate an LED V-I curve based on Vd and Rd input settings. For dimming LED supply development and test, the 41D and 42D modules include a PWM dimming output signal with programmable duty cycle and frequency. Recently updated with higher current support levels, multiple voltage ranges for higher accuracy and resolution, the 41D/42D LED loads offer the best price performance for lighting applications available. Testing of current protection devices like fuses, circuit breakers or PTC’s is automated using special test modes that increment current levels while tracking time to open on 41T model DC load modules.. 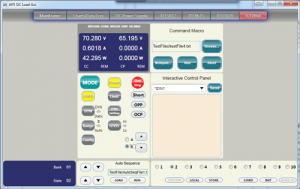 Testing solar panels or cells is supported using built-in Maximum Power Point Tracking (MPPT) mode on 41T model DC load modules. Note (1): For voltage requirements up to 600Vdc on 4 Series loads, contact factory for special quote. 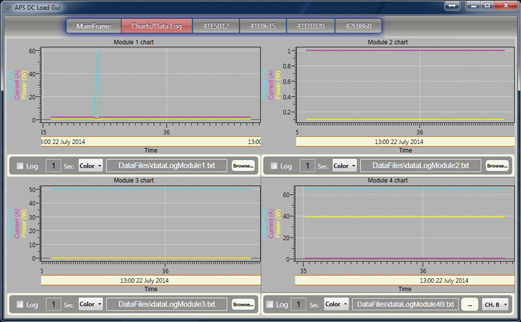 All 4 Series loads are supported by the APS DC Load Control windows software.